Last week physicists finally succeeded in directly detecting gravitational waves, 100 years after Albert Einstein predicted them. Even before then, the phenomenon inspired modernist chef Nathan Myhrvold to design a unique soup bowl mimicking the pretty spiral patterns of these elusive ripples in the fabric of spacetime. Perhaps best known as the former chief technology officer for Microsoft, Myhrvold is a physicist by training, having investigated gravitation and general relativity as a postdoc under Stephen Hawking. Those ideas have continued to influence him even after he retired from Microsoft in 1999 to pursue his other lifelong interests: food science, cooking, and photography. Notably, he founded the Cooking Lab, an interdisciplinary project involving chefs, writers, and scientists. He published a staggering five-volume magnum opus, Modernist Cuisine: The Art and Science of Cooking, in 2011. One of the hallmarks of the modernist cuisine approach is to design not just the food, but also the dishes on which that food is served. 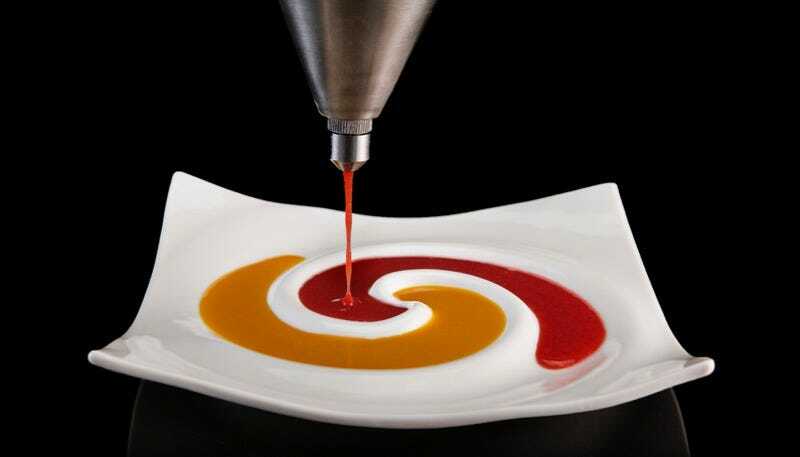 In the spring of 2014, while preparing for a dinner, Myhrvold was inspired to design a soup bowl that captured the spiraling of gravitational waves produced by two colliding black holes—the same phenomenon behind the recent LIGO direct detection of gravitational waves. To design the bowl, Nathan used Wolfram’s Mathematica to create a mathematical model that mimicked the gravitational waves of orbiting black holes just before they merge. Next, the Modernist Cuisine team turned Nathan’s Mathematica surface into a 3-D model using the machine shop’s five-axis CNC mill to carve the prototype out of solid aluminum. From there, the aluminum 3-D model was used to make a negative mold out of plaster. A local potter in Seattle cast the actual bowls using the mold. And now Myhrvold’s very special dinner guests at the Cooking Lab can enjoy their soup and marvel at the awesomeness of the cosmos (and the ingenuity of physicists) at the same time.